One of the best parts of an industry event is the opportunity to hear from your peers. We are a network of industry leaders who have seen it all, tried it, and know what works best. Fortunately, we’re almost as verbose in print as we are in person with hundreds of blogs from funeral director fashion to meticulous legal interpretation. So we decided to collect some of our favorite blog posts – the ones we recommend to others – into one list. No two voices are the same, and all offer a valuable perspective on our industry and some food for thought long after you’re done reading. This post is tagged "business" and "cremation" and that's an apt description. Tom Anderson admits that updated pricing is not a cure-all for falling revenue, but he explains how a deliberate and thoughtful evaluation of your policies can lead to careful reasoning that will support your cremation families and encourage memorialization. There are ways to add value to even direct cremation packages without significant cost, which in the end often pays off as additional revenue. The Bottom Line: Do you make it easy for families to plan with you? Do you educate while you assist in the arrangement room? Is there a connection between breastfeeding and cremation rates? Short answer: sort of. Nathan Nardi post's stuck out to us because his look at social trends in US CDC data aligns with some of CANA's own research into the demographics of cremation families. Cremation families are typically highly educated and higher income while casketed burial families are typically homeowners who have lived in their communities for multiple generations. The Bottom Line: What community are you serving and how does understanding them help you meet their needs? Larry Stuart, Jr. knows exactly what the details of his service will be and, no surprise, he’s not shopping for the low-cost cremation provider. Like one of CANA’s most popular posts, Just Cremate Me, Larry reminds us that we can’t lessen the pain of those we leave behind, especially not through cremation-and-landfill method. The Bottom Line: How can you show your cremation families that they are valuable and worth remembering? You've heard it a million times, you have to educate cremation families. Whether it's because death is too sanitized, we're not trusted, general fear of mortality, or something else, as a society, we don't like to think about death. To many, cremation seems like the simplest way to avoid it but it can't be avoided. So Mark Allen of the Order of the Golden Rule provides a script to help. The imagined conversation with John Q. Public (fully-bearded and chest out, no less) is as informative as it is funny. The Bottom Line: What has worked best for you to tell cremation families why they matter? Family protectiveness meets "professional empathy" in this post where Matthew Morian of the Millennial Directors, reminds us that it's the little things that make a difference to our families – even the direct cremation ones. The little details surrounding the arrangements become second nature to funeral directors and we often forget to discuss them with the family. But it's all those little details that the family craves, and often misunderstand or misconstrue when we gloss over them. Taking time to explain them is one way to set yourself apart from the competition when it comes to exceptional service. The Bottom Line: You know that a typical work day for you is far from the typical day for the families you serve. How can you keep the boring part of your work fresh for the experience of your families? Many people have theorized that our society experiences many "little deaths": moving away, our own or a loved one's divorce, changing jobs, and, in this case, the donation of a favorite stuffed animal. The CANA Historian, Jason Engler, is particularly suited to reflecting on how quickly things can change and encourages us to make each goodbye count for the families we serve. The Bottom Line: No one wants to say goodbye, so what can we do to make that goodbye just a tiny bit easier? Like most funeral directors, Glenda Standsbury hadn't preplanned. And that's surprising -- funeral directors advocate for preplanning, see too often the questions that pile up without a plan, and are reminded of mortality daily. After walking away from a major accident, Glenda felt that she'd escaped death once and reminds us all that "none of us should assume that we'll be here tomorrow to take care of the details." The Bottom Line: It's not just your funeral to pre-plan, but your business and estate. Do you have a succession plan? One of biggest values of choosing cremation is the time it gives the grieving to make decisions. ASD's Public Relations Specialist, Jessica Farren, shares her deeply personal story of grief and remembering her father for who he was. Her honest reflection and her descriptive style makes this story vivid and relatable. The Bottom Line: Cremation is not just a cost consideration -- it's an immediate answer to a question of "what now?" that allows for services months, years, or a decade, after a death. How can you support cremation families throughout their grief journey? The Bottom Line: We know from several recent headlines that risks of keeping the urn at home can lead to dramatic and depressing indignities — and that too many consumers don’t know their options for placement. How can you help your cremation families connect with the urn and educate about memorialization? 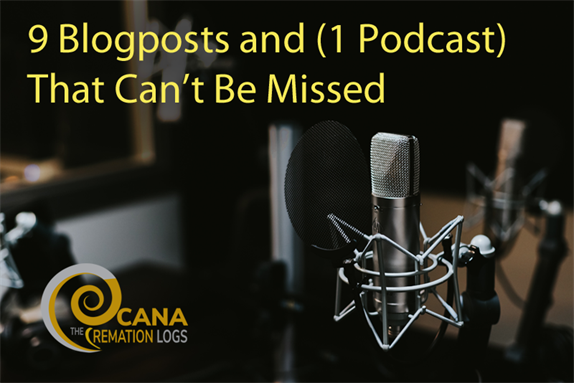 CANA Staff had a great time developing this list and there are plenty we left off that stand out in our minds: Is Smoking Cremains Abuse of Corpse?, Viceland’s Most Expensivest Celebration of Life, and Funeral Cribs among them. What are you reading and listening to that belongs on this list? Leave us a comment!